Disability Network Southwest Michigan will host a community-wide celebration of the 27th anniversary of the signing of the Americans with Disabilities Act. Please join us on Friday, July 21 at our Kalamazoo office (517 E. Crosstown Parkway) from 11:30 a.m. to 1:30 p.m. for a free lunch, presentations and awards ceremony. This year we are pleased to welcome RoAnne Chaney, Executive Director of Michigan Disability Rights Coalition, as our keynote speaker. The ADA anniversary celebration has become an annual tradition at Disability Network as we gather with our customers, community partners, neighbors and elected officials to celebrate the passage of this important civil rights legislation which grants protection against the discrimination of people with disabilities. Each year at our ADA celebration, Disability Network awards the Bob Davis Independent Living award to an individual with a disability who has made great progress in meeting their independent living goals. We are pleased to present the award to Robert Schindler from Berrien County who has successfully secured employment, moved into his own apartment and continues to reach out for new opportunities in his community. Please join us at our ADA celebration to congratulate Robert on his accomplishments and on winning the Bob Davis Independent Living Award. 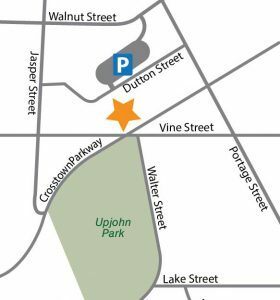 Thank you to Kalamazoo Valley Community College for allowing us to use their parking lot just behind our building on Dutton Street between 11:00 a.m. and 2:00 p.m. Look for the ADA event parking signs.